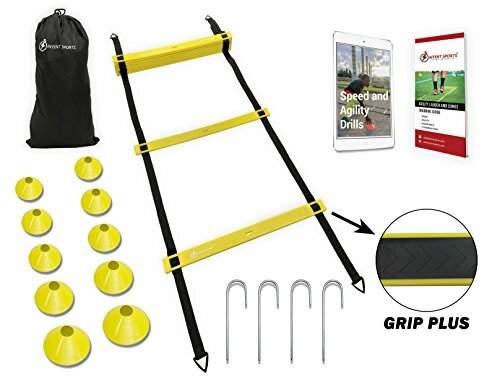 COMPLETE SPEED AND AGILITY LADDER KIT with super heavy duty 15 foot ladder, 10 rugged disc quick cones, 4 rugged steel metal stakes, drawstring carry bag, and BONUS guide and ebook to help you use your set and get the most from workouts. This is just what you need to improve your strength and explosiveness to be more competitive in sports, football, basketball, baseball, or any sport. Essential for core workouts and strength training. Great way to lose weight, improve cardio function, increase oxygen in blood, stabilize metabolism, and stay well year round. IMPRESSIVE GRIP PLUS TECHNOLOGY on the back of the ladder gives you the non-slip experience not found with other ladders. This heavier ladder firmly grabs hold on pavement, grass, concrete, and synthetic. Use it indoors or outside. Insist on this better quality heavy duty kit used by professional athletes and experienced trainers. When other ladders crack and fall apart, this one can handle all the abuse you can throw at it. Have your whole team use it! 100% MONEY BACK GUARANTEE ensures this will be your best bet for a pleasing no-risk purchase. Many customers are so impressed by this set they return to buy another for a friend. HURRY AND BUY NOW while we have a fresh shipment in stock. This makes a much appreciated gift for friends, family, and co-workers - anyone who wants improved training and results! GET PRO SPEED & AGILITY with this premium Speed Agility Ladder training kit with 10 heavy duty disc quick cones. This is everything you need for the ultimate workout and training. Perfect for giving you the competitive advantage and optimizing your conditioning. Just right for football, basketball, sports, core workouts. 15 FOOT HEAVY DUTY LADDER is heavier than others. It can take professional stress and strain all day long, day after day, for years of rugged, reliable service. This is the toughest ladder in the price range. We include 4 steel metal stakes to for easy, convenient use. GRIP PLUS WON'T SLIP! Improved technology on the back gives you a firm, non-slip grip on any surface: pavement, grass, concrete, or synthetic. Works equally well indoors and outdoors. You don't get interruptions and fails having to reposition a slipping ladder. Step up to this better quality design. BONUS GUIDE & EBOOK give you complete easy-to-follow instructions and workouts. Helps you improve speed, agility, explosiveness for ultimate competition in sports and optimum physical condition. We also give you a luxury drawstring carry bag to store the ladder, stakes, and cones. Take this to the track, the park, to work for a quick workout during your lunch break. Great way to lose weight and get into shape fast! 100% SATISFACTION GUARANTEE ensures this will quickly become your favorite no-risk purchase. Many people are stocking up with a couple of these to workout with a friend or spouse. HURRY AND BUY NOW while we have this popular accessory in plentiful supply. This makes a thoughtful birthday gift, holiday present, or anniversary gift. If you have any questions about this product by INTENT SPORTS, contact us by completing and submitting the form below. If you are looking for a specif part number, please include it with your message.